Sedona, Arizona is like a city within the Grand Canyon. 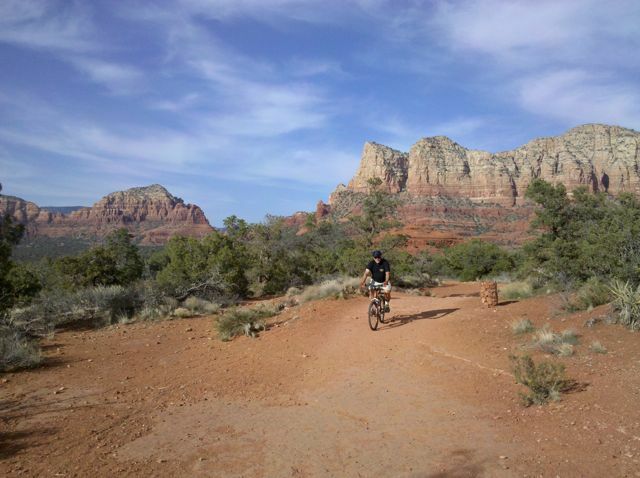 Surrounded by amazing red rock formations that are mostly on forest service land, it has become a mountain bikers’ mecca with new trails opening up frequently. However, most of those are for more advanced ability levels. What is available to the more casual rider? 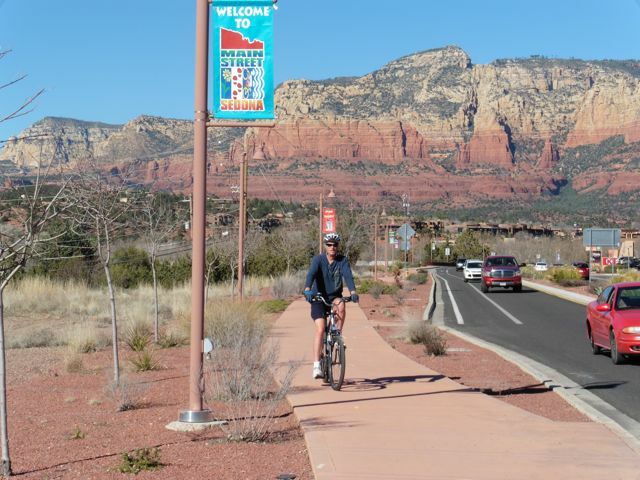 Thanks to the reconstructed main N/S highway (179) and an existing spectacular novice level mountain bike trail, cyclists have the choice of traversing all of Sedona by riding in bike lanes along the highways , or, as we always choose, by staying completely off the roads, while visiting some of the city’s highlights that draw tourists by the millions annually. And there are of course plenty of places to complete your Bike ‘n Brunch! We recommend a hybrid or mountain bike for the most versatility. Be warned there are some hills involved and an altitude of about 4,200-4,500 feet, so it’s not as easy as some of the other rides that we have described, but it is very doable and rewarding with constant scenic vistas, so just take it easy; stop and take photos! 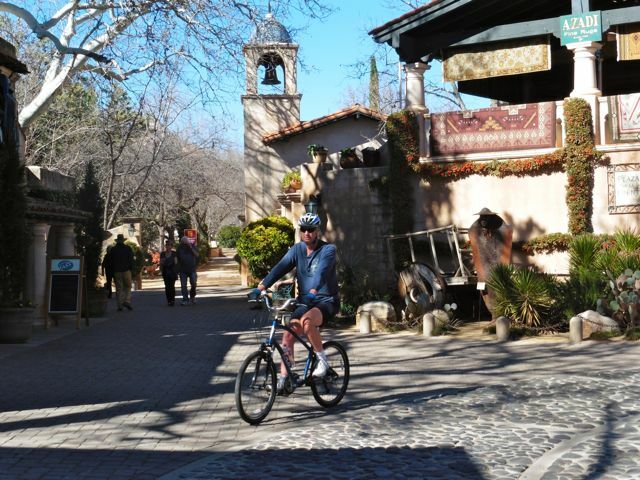 Tlaquepaque Arts & Crafts village, a bit of Spain in Sedona, its main tourist attraction. 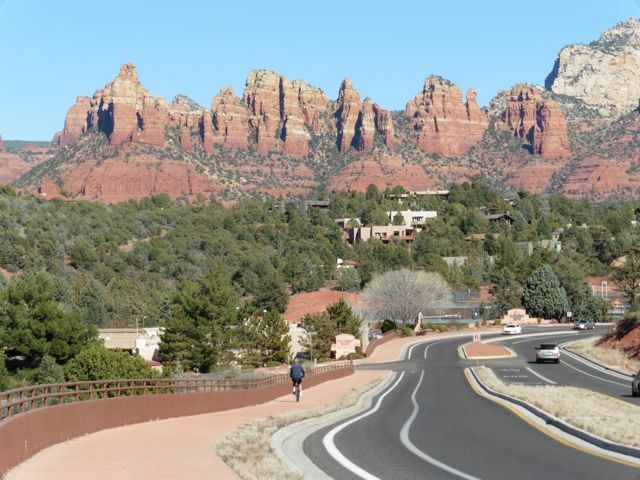 Hwy 179 was rebuilt all through Sedona to include bike lanes, and within the city limits are fabulous scenic uncrowded legal sidewalks for those who prefer to stay away from the distracted drivers gawking at the scenery! Plenty of scenic vistas along the Hwy 179 sidewalks. A nifty undercrossing at the Mystic Hills development moves the sidewalk to the east side of 179 prior to reaching the Chapel district. 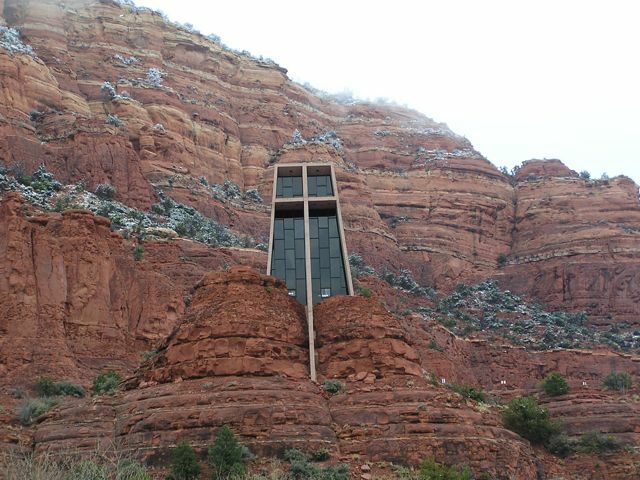 The Chapel of the Holy Cross, another main attraction, is accessible via a detour east down Chapel Rd or adjacent (to the south) less crowded side streets. 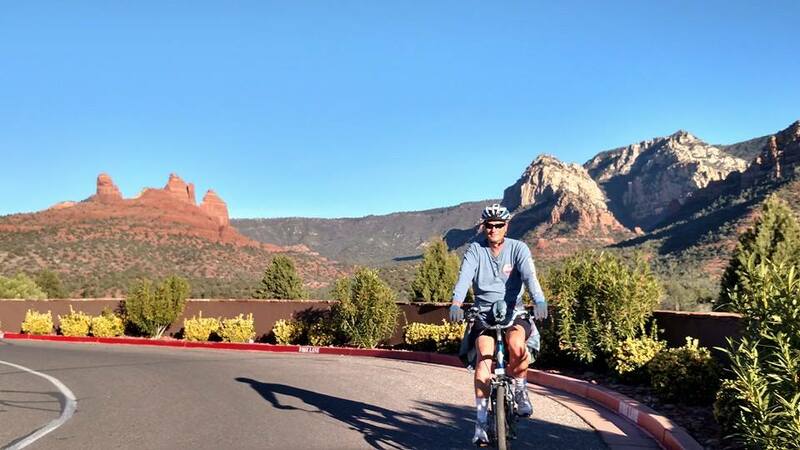 Riding around Uptown Sedona, also accessible via bike lane or sidewalk. 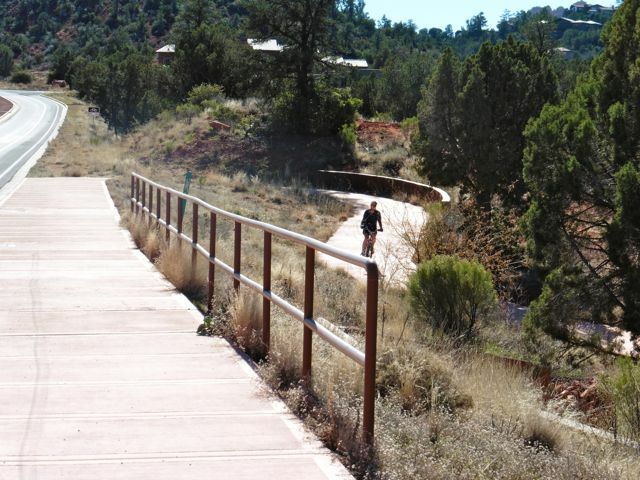 To continue south along Hwy 179 to the Village of Oak Creek and more dining options, you can take the bike lane along Hwy 179, or the spectacular novice Bell Rock Pathway, staying off the roadway altogether. 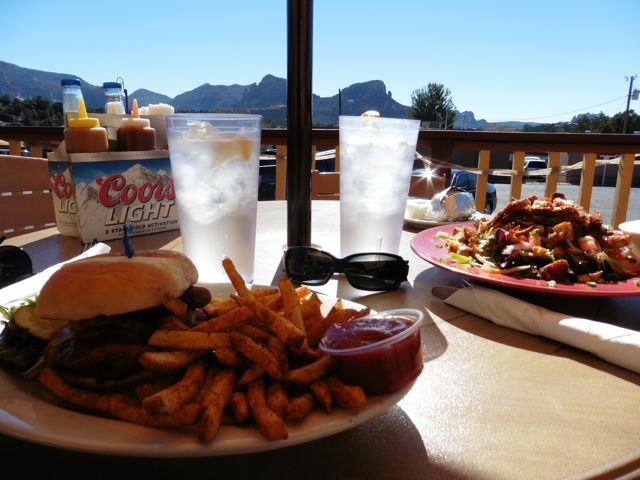 One of your possible rewards, Red Rock BBQ’s patio with good food and spectacular vistas (near jct 179 & 89A). Update 2019: Now occupied by Oregano’s Pizza Bistro.